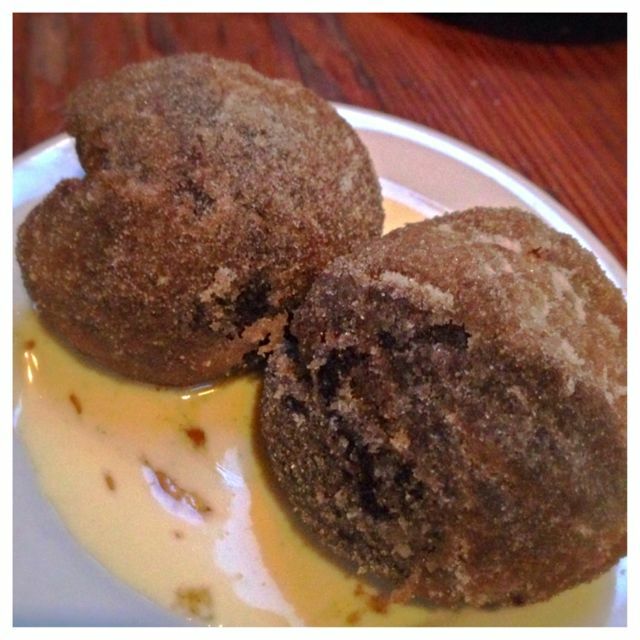 Having been to Tasty n Sons just recently we knew that their Chocolate potato donuts were really good. That was our dinner dessert there, but today, they were about to become our breakfast appetizer. Breakfast is the same as dinner, in that they tell you it will be served family style. That works well for us since we always like to share dishes for more variety. 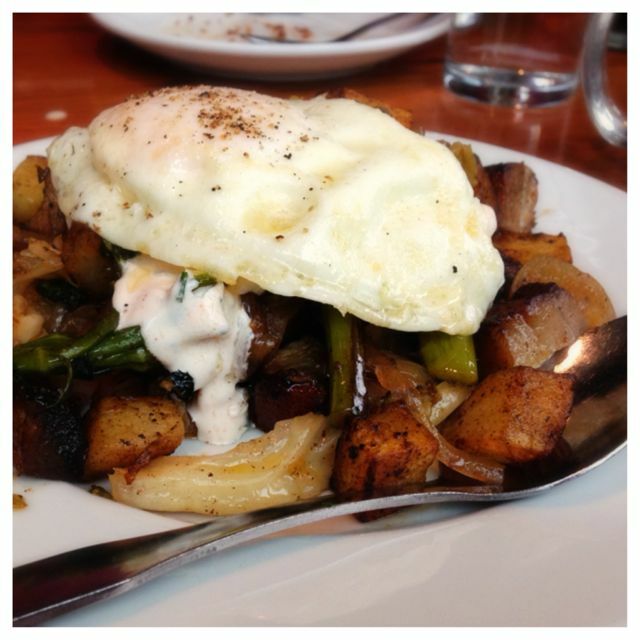 The Tasso Hash caught my attention because Tasso is something I discovered recently at Nora’s Table. Tasso ham is a specialty of south Louisiana cuisine. It is a spicy, peppery version of smoked pork. The few places I have found it usually do their own smoking of the pork. At Tasty n Alder you can see the huge chunks of Tasso ham, which are the same size as the potatoes. So far every Tasso ham we have tried has had a slightly different flavor. This one was great because it had a great depth of flavor that came from the smoking, the the big chunks allowed for that flavor to just settle on our tongue with each bite. 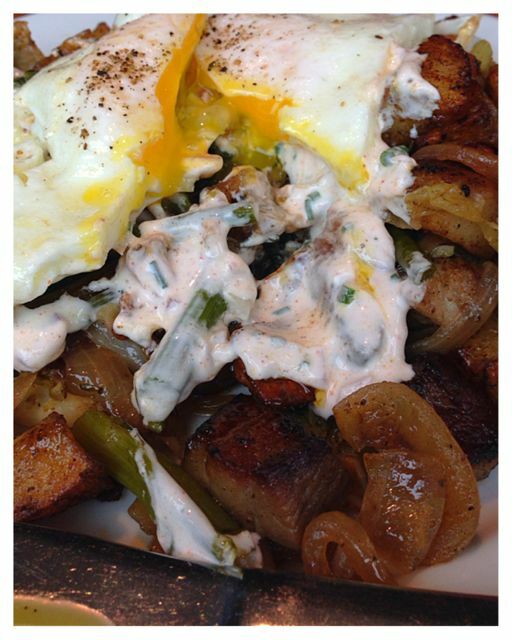 The hash was topped with an onion sour cream and of course an over easy egg, that spilled over the whole dish. Great hash! Tasso Hash with onion sour cream. Our other dish is not something I would normally order for breakfast. Steak and eggs. I will order pork dishes all the time, but not steak. Why is that? Anyways the whole dish was in a skillet atop crispy cornbread with jalapeno butter?. 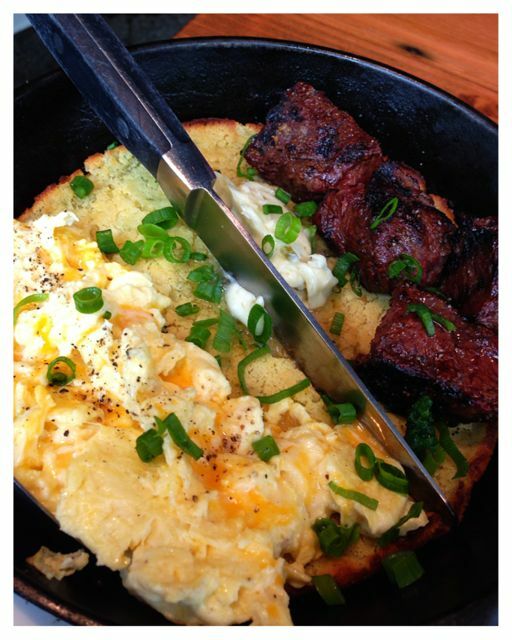 Scrambled eggs on one side and very tender steak in large chunks and great flavor, on the other side. Don’t be shy though, you will want to combine the flavors for the perfect bite. I loved the cornbread, but my husband thought it was rich. I didn’t think it was rich at all. It was a cross between crispy on the edges and gooey on the inside. The people near us got the enchiladas with eggs on top and that looked really good too, but we didn’t have room for any more. This was definitely a big breakfast for us. We enjoyed it all and didn’t eat again til dinner. My favorite dinning experience was Toro Bravo because the Chef’s counter is low enough to watch everything. My favorite service came from Tasty n Sons. Our server was exceptional. My favorite location and space has to be Tasty n Sons. The menus do have a few of the same thing, but each restaurant definitely has their own dishes. In the end I don’t have a favorite overall. I would go back to all 3 of them at any time. Do you have a favorite? Atmosphere is very modern, cozy and lively. There is an open kitchen and a beautiful bar that can be seen from anywhere in the restaurant. Pricing was about $12 on average for large plates. They served Steven Smith tea. Not sure what the coffee was and their Bloody Mary’s are very popular drinks here as well. Great presentation for sure. Tasty n Alder is located on SW 12th Ave.